"It looks a little bit like grandpa and grandma's place," says the lady at the entrance apologetically. Indeed it does. 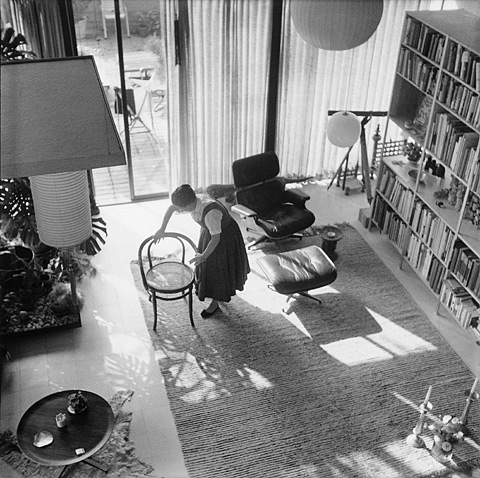 The Eames House or, as it is also known, Case Study House No.8 near Los Angeles, an icon of mid-century Modernism, is stuffed full of silk flowers, pot pourris, baskets, pot plants, dolls, other toys, folklore from the American Southwest and other objets trouvés of all kinds. There are little gold angels hanging from the spiral staircase and the living room table is packed with paperweights, ashtrays, minerals, stones and candles. The kitchen cupboards are even fuller: they are piled high with tea towels boasting blue floral patterns, cutlery, marbles, vases, candles and yet more candles. Nobody has done any throwing out here for a long time. 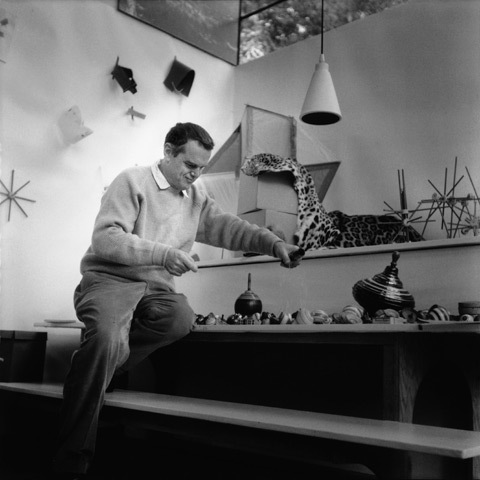 Charles Eames was 71 years old when he died in 1978 and his wife Ray was 76 when she followed him ten years later to the day. Almost 40 years earlier, it was Christmas 1949, they moved into their home in Pacific Palisades - at the time, still a suburb of Los Angeles. 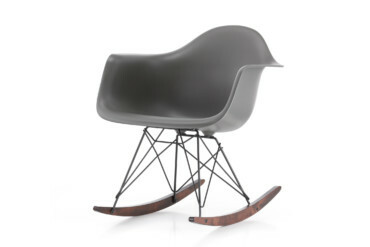 "That's some collection," think visitors who associate the name Eames with Modernism, and Modernism with simplicity. 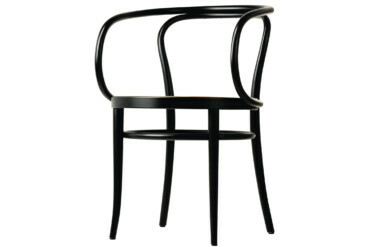 Then, however, in the house's architecture, he finally discovers what he is looking for: clear lines. Two double-storey cubes - a residential house and a studio - arranged as mirror images of each other and connected by a small courtyard. The occupants lived and worked in spacious surroundings, both the living room and the work area in the studio extend as high as the roof. Conversely, in both buildings, the bedrooms, bathrooms, kitchens and storage rooms occupy two floors. The steel frame construction is visible both inside and outside; at the time this was revolutionary. 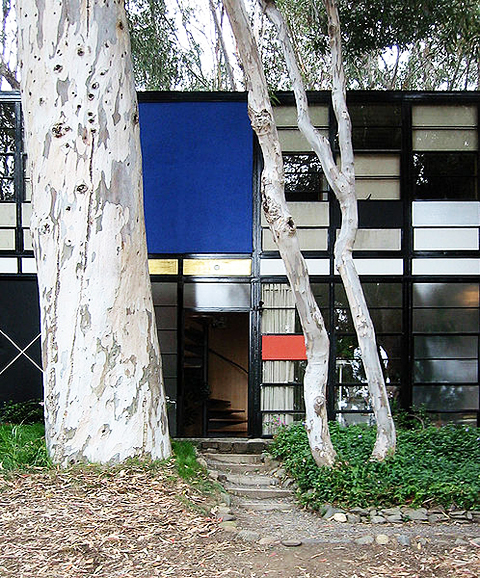 The edifices stand behind a row of eucalyptus trees on a slope and through the leaves it is possible to discern bright, gleaming panels, red, blue, black, silver, gray and grayish white plaster. A number of windows are translucent, others made of wired glass, others still are transparent. The sun is reflected in the panes. The transition from the inside to the outside is utterly smooth. No question about it, we are standing in front of one of the most remarkable houses of the 20th century. Icons, however, are also always surrounded by myths. 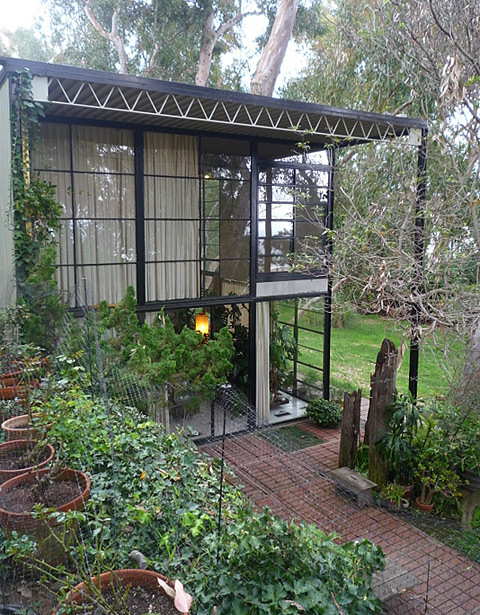 By way of example, even today, the Eames House is said to be one of the first prefabricated steel houses in history. This is true, but only partially so. 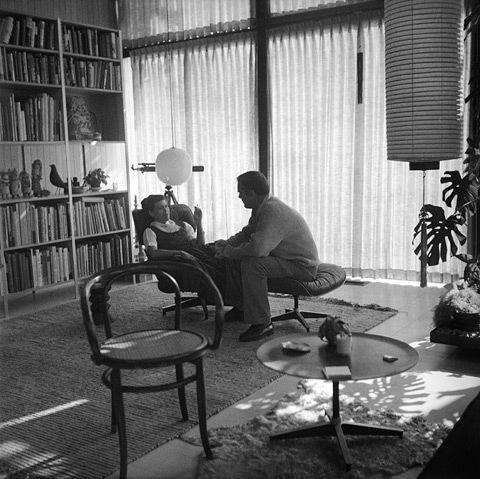 The steel parts for the façade, in particular, had to be made by hand and for an entire year staff at Eames Office finished the windows one by one. 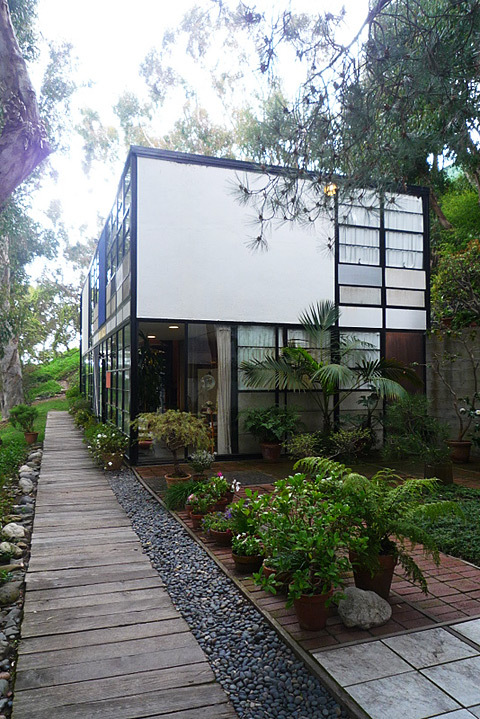 As a result, the one dollar per square foot that Charles Eames had calculated for the outside construction soared to legendary proportions. The reason: he had not, in fact, factored in the labor costs for his employees. 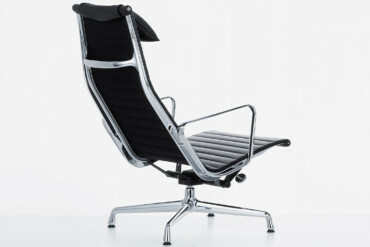 Another myth is the notion that the Eames were the kind of Modernists who favored extreme simplicity. It is said that originally the living room was meant to remain unfurnished. 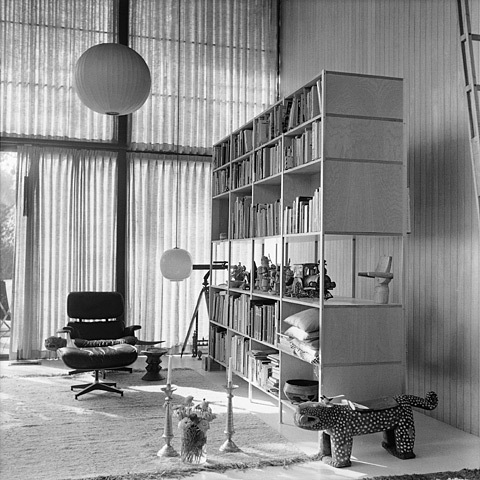 However, Ray Eames very consciously opted for so-called "functioning decoration". She gradually collected objects of all kinds and arranged them on every possible surface, including the floor. Robert Venturi, who hated Modernism with a passion, accordingly called the house a shrine. 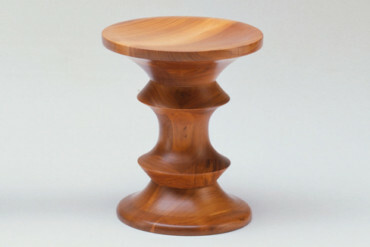 "It gave me great pleasure," he reported, "when I recently wrote that the Eames had reintroduced good old Victorian muddle in their home. The architecture of Modernism always wanted everything to be clean and orderly and then along came these two, spreading their eclectic assemblages all over the entire interior." 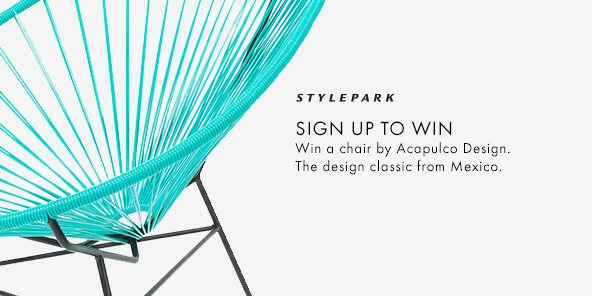 At some point, however, life must have triumphed over concept. 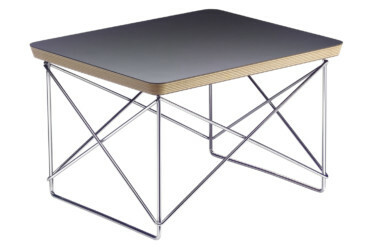 Because the Eames House not only look like grandma and grandpa's place. It also smells like it. It smells of mothballs. Of dust. Of times past. 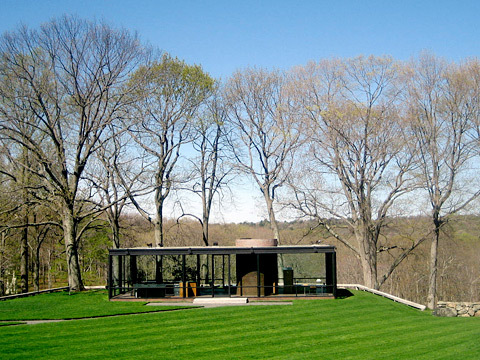 By contrast, in Philip Johnson's Glass House visitors are not met by a strong smell. Both Johnson and his long-year partner David Whitney were heavy smokers and, when, after Johnson's death in 2005, his house in New Canaan, Connecticut passed into the possession of the National Trust for Historic Preservation, the first thing that the new owners did was to give the place a thorough airing. After extensive renovation work the nicotine-stained ceiling was white again and the Glass House odor-free. However, when, in 2008, the National Trust reopened Johnson's salon in the form of the "Glass House Conversations", it commissioned preservation theorist and artist Jorge Otero Pailos with a remarkable installation. Otero Pailos, a Spanish researcher into historical background sounds and smells, sees both the latter as an integral part of historically charged buildings. 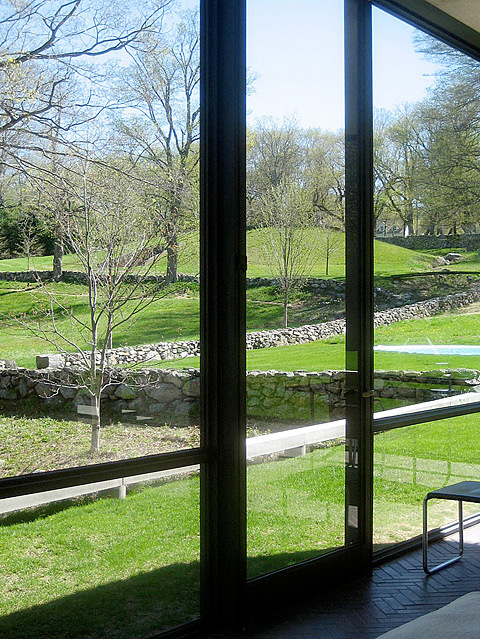 He created three scents for the Glass House: the combination of the odors of glass and steel that the house radiated when first built; the mixture of the various male scents "gay men in the 1950s", when Philip Johnson and David Whitney gathered together the homosexual intellectual and artistic scene from nearby New York in the Glass House; and the odor of cold cigar smoke dating back 56 years, as Johnson and Whitney lived and smoked here that long, from 1949. Unfortunately, although not really surprisingly, the National Trust did not spray these scents throughout the house, they are still kept in three little vials. Not only our sense of smell, our sense of vision also has hardly any impressions to process in the Glass House. The glass cube is sparingly furnished, there are no decorations. The fitted kitchen is simple and was probably used more to mix drinks than to cook food in - Johnson had meals delivered and served at the dining table that stands immediately next to it. 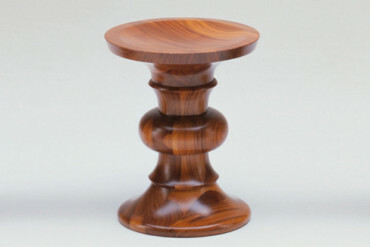 The ashtray on the glass table is, of course, purely functional. Even the painting by baroque classical painter Nicolas Poussin is not there for decoration but serves as a counterpoint to Mies' Barcelona furniture and - together with a walnut cupboard element - as a partition. Hidden behind this is Johnson's bed and, enclosed in a round brick core as high as the room, the bathroom. 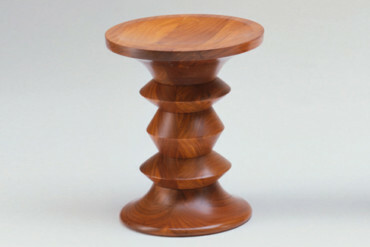 The formal minimalism goes hand in hand with a functional one. 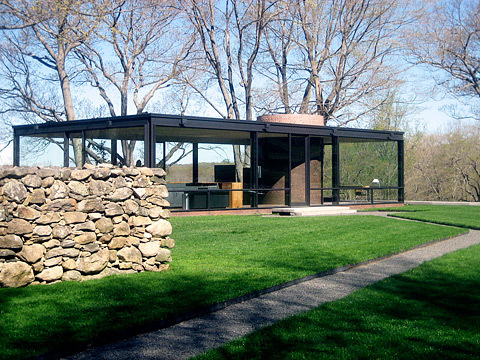 The Glass House was used for receiving guests, eating, drinking, smoking, showering and sleeping in. Johnson satisfied other needs in separate buildings. 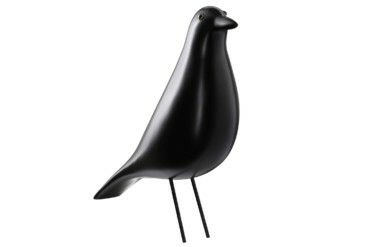 A large number of these are scattered over the nine-hectare grounds in New Canaan. Further east on the estate, for instance, there is a library and study house, the building where David Whitney slept and the entrance building, a rather unsuccessful post-modern experiment. From the Glass House there is a view of an artificial lake, on the banks of which stands a miniature temple. With these unusual proportions Johnson wanted to create a false impression of a greater distance between the house and the water. 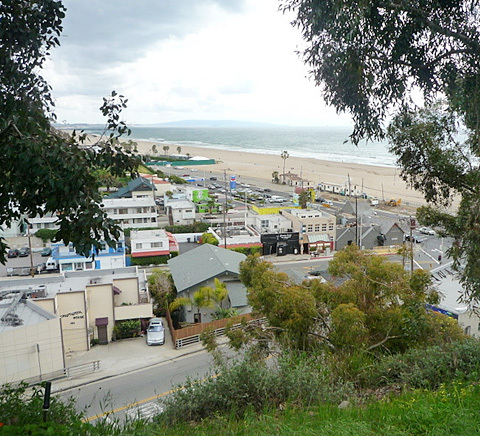 West of the main building lies a picture gallery built into a hill, in which he collected and exhibited works by artists such as Andy Warhol and Frank Stella. Slightly further on, visitors come across Johnson's sculpture gallery, a white 1970s building with several levels and a glass roof. The architect also scattered sculptures over the rest of the grounds, for example, works by Donald Judd. The most important ancillary building is, however, the guesthouse. It stands directly opposite the Glass House and, with its brick walls, forms a formal counterpoint to the former's transparent lightness. Apparently, Philip Johnson preferred to use this almost completely self-contained edifice himself. It is said that he did not appreciate guests staying overnight. However, since 2008 nobody has been allowed to enter this brick house, either by night or during the daytime. The walls are no longer watertight and are going slowly rotting. The restoration work is expected to be completed by spring this year. And we can only hope that in this case the National Trust will also be able to get rid of the smell.